supported, and the kids find themselves with the added benefit of “extended family.” The children have consistent people in their lives that are familiar, fun, and safe. Not everyone is called to foster or adopt, But EVERYONE can get involved. PROGRAM LAUNCHES 2020!! ﻿Click here to sign up for a Care Community today! permitted to travel with them or in case of a family emergency. Support Advocate becomes the "asker" for the foster family. This person has a vital role to identify needs for the family or look for ways to bless the family and then reaches out to the Resource Supports to get the job done. 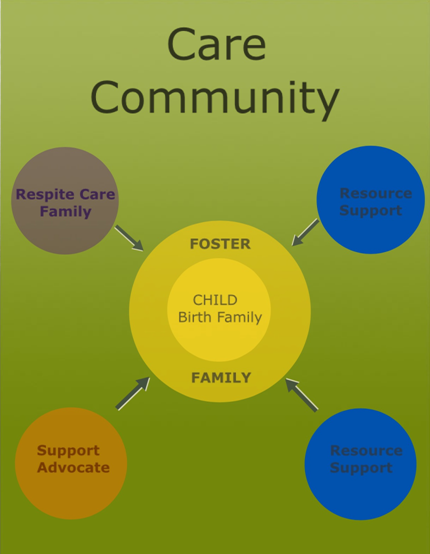 Resource Supports can offer assistance to the foster family for various things as identified by the Support Advocate. There are many opportunities to serve a foster family as they care for additional children. For example… A meal prepared when a new placement arrives, help with laundry as the foster parents transport foster child to visits or appointments, providing diapers, babysitting child while foster parent makes phone calls or meets with caseworkers in the home, a set of extra hands at a doctor appointment or when traveling to appointments, gathering clothing, toys or needed baby equipment when a new child is placed in the home. Not only do the foster parents feel some pressure removed, the precious kids find themselves with the added benefit of “extended family.” They have consistent people in their lives that are familiar, fun, and safe. Most kids love a big cheering section at their ballgames and recitals. Foster kids are no different! Not everyone is called to foster or adopt, but EVERYONE can get involved.